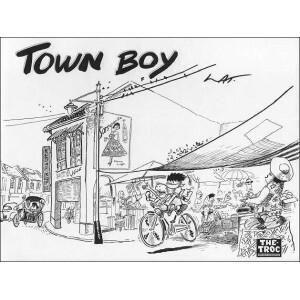 After his village childhood in Kampung Boy, LAT revisits here his adolescence in the town of Ipoh, in the Sixties. A nostalgic and funny touch ! Mohammad Nor Bin Khali (LAT) was born in 1951 in Kota Baru, a small village (kampung) in the north of Malaysia. He began his professional career in 1964, at the 13 years old : he had sent his drawings to an editor who, persuaded that the author was an adult, proposed to publish them. In Malaysia, LAT is so famous that the McDONALD firm has even open a "Kampung Burger"!